The aligners are made through a combination of your dentist's expertise and 3-D computer imaging technology. Invisible- No one can tell you're straightening your teeth. Now you can smile during treatment as well as after. Removable - You can eat and drink what you want while in treatment; plus brushing and flossing are no problem. Comfortable - It has no metal to cause mouth abrasions during treatment. And no metal and wires usually means you spend less time in your doctor's office getting adjustments. 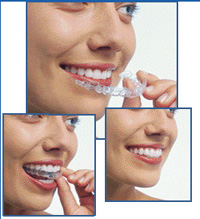 Diagnosis and Treatment Plan by an Invisalign ®-trained dentist. No Metal Wires and Brackets. Convenient Treatment At Our Office. 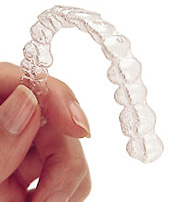 Talk to us today to see if Invisalign ® is right for you!